Graduate courses in the MBA are listed below in numerical order. Leadership means accomplishing through others. Implementing successful change in organizations requires process skills in facilitating the performance of individuals and teams. The development of coherence in the collective consciousness of the organization provides for friction-less flow of communication and implementation. Topics include change management skills; life cycle of the consulting process; motivation for performance improvement; individual, interpersonal and team behavior; negotiating collaborative solutions; organizational learning; and the role of training in strategy implementation. This course covers the theory and practice of performance improvement in both large and small organizations in the manufacturing and service sectors so that they operate in accordance with all the laws of nature. The focus will be on using lean thinking to transform every activity in an organization towards sustainable operations. Students will explore how to extend the principles, rules and tools of lean thinking to achieve sustainability along with the improvement in quality, reduction of costs, and maintenance of customer delight. Prerequisites: MGT 5180 and MGT 5240. Skill in the use of office software is essential for data storage and manipulation, financial analysis, and the effective presentation of text and images. Students will learn the practical and managerial skills for implementing sustainability through value based process improvement in both large and small organizations. From local regulations about water quality to global initiatives like the Kyoto Accord, the law is an important tool for regulating our use of the environment. State and federal taxation are instruments of social policy. The principles of taxation must be considered in the planning and decision-making process of every organization whether profit or non-profit. This course surveys basic tax concepts and their use in individual and organizational tax planning. Accounting systems provide financial information to guide management planning, decision-making, and control. Financial statements show the current standing and recent activities of the firm to management, stockholders, creditors, and the government. The course explores the fundamental laws of nature that structure success in financial accounting. Content covered includes knowledge of alternative business organizations, economic concepts, financing and working capital, information technology, and management accounting. As independent auditors, CPAs verify the fairness of corporate financial statements and thereby enhance the confidence of those making investment decisions. Auditors play the role of the Second Element by dispelling doubts about the truthfulness of financial statements. Students explore and gain the knowledge of generally accepted accounting principles (GAAP) for business enterprises, not-for-profit organizations, and governmental entities, and the skills needed to apply that knowledge. GAAP is seen as a reflection of collective consciousness that specifies rules for financial reporting. Man-made laws are created to restore the path to right action and meet social needs. In this course, students gain knowledge of legal and ethical responsibilities required for professional accountants. This course examines key principles and methods of creating and sustaining performance excellence in both service and manufacturing organizations through application of the “Lean Enterprise” and “Lean Six Sigma” performance-improvement systems. Best practices of world-class companies will be examined through readings, case studies, and management simulations. This course provides analytic tools and techniques to assist management in planning, decision-making, and control. Both inner knowledge and information from the environment are critical to properly manage business risks. In this course on topics covered in Part 2 (of 2 parts) of the Certified Management Accountant (CMA) examination, the student is exposed to relevant professional skills and topics in financial statement analysis, business performance metrics, profitability analysis, investment risk and portfolio management, financial instruments and cost of capital issues, international finance, corporate restructuring, decision analysis, and investment decisions. The new goal of sustainability requires new metrics for measuring and reporting its achievement. Modern financial management utilizes computerized accounting packages for efficient record keeping, safeguarding of assets, customer service, and financial analysis. The tools of managerial data analysis enable managers to transform raw data into useful knowledge of business performance in every functional area of business by identifying meaningful patterns and relationships in business data. Increased knowledge of business processes provides a foundation for improved business decision-making and enhanced business performance. Operations management is concerned with the process of transforming inputs into higher-value outputs with maximum efficiency. Through its operations, a business transforms inputs into higher-value outputs. Principles of financial and managerial accounting are treated in this course from the perspective of the manager who uses accounting reports rather than the accountant who creates them. Students will learn key principles of data analysis and statistical thinking that underlie contemporary management approaches to improving business performance and quality through business process improvement, such as the Six Sigma and Lean Six Sigma system employed by leading companies worldwide. Prerequisite: MATH 153 and MGT 5170 or equivalent. An increasing number of organizations are concerned about social and environmental responsibilities in the context of sustainable development, and are interested in developing tools to improve their performance and accountability in these areas. This course introduces students to these issues with emphasis on current research in these fields. The key to sustainable progress is to align individual and collective consciousness with total Natural Law available in the Self of everyone. Any business proposal involving sustainable technologies must analyze the performance and economics of the technology. The course has a practical focus on career planning and entry into the job market. In the framework of Consciousness-Based principles for success, students consider their own skills, abilities, and objectives, and learn to design a career that utilizes their talents and creativity for maximum effectiveness, achievement, and evolution. They design an action plan to implement their career goals, and then work with the best Internet resources to research business and service organization profiles and industry trends. People are an organization’s most important asset. Success comes from organizing and managing people to produce the products and services that customers value. This survey course exposes students to the full array of human resource functions: human resource planning, recruitment and selection, training and development, performance evaluation, and compensation. Human resource development involves identifying the specific requirements of client organizations and constructing evaluation procedures that accurately document instructional outcomes. In this course, business students learn how Enterprise Resource Planning (ERP) systems permit integration of business functions into one seamless information system. Students receive in-depth training as business functional analysts in finance and control through a specific ERP software application. They will learn a five-step ERP implementation methodology: project preparation, business blueprint, realization, final preparation, and implementation. Then, students apply what they have learned to a business scenario via a simulation. Students experience how business process mapping provides the fundamental, integrated intelligence for all ERP systems. (4 credits). Prerequisite: Managerial Accounting at the level of MGT 316 or 5232. Effective managers have a good understanding of information systems and the opportunities provided by rapidly evolving technologies. Students in this course learn the fundamental concepts in the design and management of information systems. Topics include different types of information systems as well as tools and technologies such as networks, hardware, software, services and data. Attention will be paid also to hot new technologies like cloud computing, mobile computing, social networks and predictive analytics, with a focus on their managerial implications. Information systems are a key enabler of a dynamic business strategy. Information Systems consume a significant and increasing portion of an organization’s budget. Research has shown that effective governance and deployment of information systems can provide 20% greater return on assets. An MIS professional, aspiring to be a leader, must know how to effectively align and deploy information systems to support business strategy and maximize business performance. This course covers different types of Information Systems strategies and their alignment with business strategy. The course will include several case studies to develop a good understanding of information systems strategy formulation and implementation. (2 credits). Information systems consume 2–20% of an organization’s budget. Managing these investments effectively can lead to superior business performance. The purpose of this course is to understand the administration, control, management and governance of computer-based information systems, projects, and relationships with the organization. Information systems are a key enabler of business processes and work flows in business organizations. Every large and small enterprise has implemented or is considering implementation of enterprise resource planning (ERP), customer relations management (CRM), supplier relations management (SRM), business intelligence (BI) systems and others to provide relevant information just-in-time in a secure way to relevant stakeholders. This course covers the concepts and methods associated with the definition, structure, creation, and utilization of databases for computer-based information systems. The amount of data in organizations is growing exponentially, doubling every 18-24 months. Structured data from traditional information systems is now augmented by huge streams of data from devices, social networks, web logs, etc. Organizations that are not prepared for this increasing volume, variety, and velocity of data can drown in these streams of data, while the prepared ones can mine the data for new insights and initiatives almost in real time. This course covers the fundamental concepts of managing and mining data to support business decision making and drive business value. Prerequisite: CS 422 or MGT 5410. The systems approach is an organized way of dealing with a problem. This course focuses on the middle stage of the software systems development life cycle—the detailed system study that follows a feasibility study and that is in turn followed by software engineering. The detailed system study analyzes a system in detail to gather requirements and analyzes its process elements for suitability and relevance to meet the needs of the system’s users. This leads to an iterative and creative design process, using tools such as flowcharts, data flow diagrams (DFD), data dictionary, decision tables and decision trees, to provide an effective and detailed design of the system. Securing their networks and data is a key concern for all organizations. An increasingly complex IT infrastructure, including cloud computing and mobile device based access, creates many vulnerabilities for organizational networks and data. The Internet is a platform for communication that is instantaneous, nearly cost-less, and can reach both large populations and narrowly targeted groups. This changes the way firms work with their customers, their supply chains, and even their internal operations, and it creates opportunities to measure the effectiveness of tactics as never before. This course surveys server and hosting options, network and telephony protocols, markup languages, Web development tools, and electronic commerce packages and analyzes the current best practices in distribution, pricing, and product customization made possible through electronic commerce. Examples of major Internet business models are reviewed, including portals, auctions, community, vertical industries, and automation platforms. Financial management provides an intelligent direction to the flow of funds for maximizing firm value. This course introduces techniques and concepts necessary to effectively manage the financial resources of any organization in order to achieve strategic goals. The development of human resources is the most significant responsibility of managers in the knowledge economy. This course surveys the practices of employee training and development, examines research on ways to unfold the creative intelligence of personnel, and looks at the higher stages of human development required for higher levels of managerial responsibility (2-4 credits). 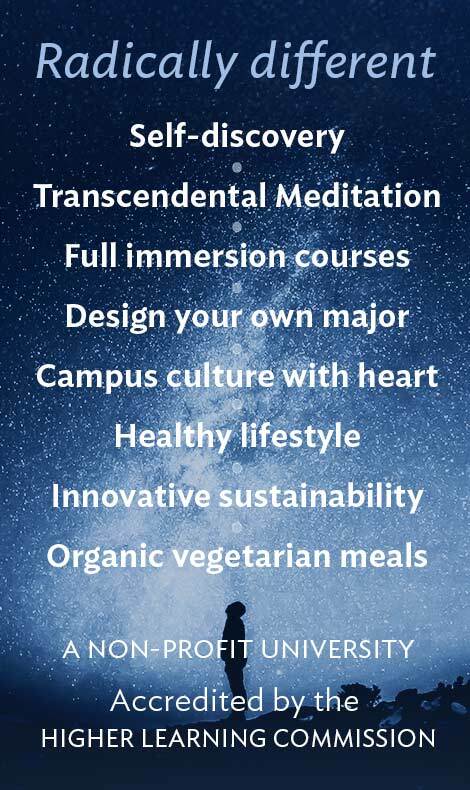 This course comprises the Transcendental Meditation Program Teacher Training Course, providing the knowledge and experience of consciousness as the basis of life and preparing one to present the knowledge to others. It also gives an opportunity for personal development through deeper personal experience of the Unified Field of Natural Law and understanding of the Science of Creative Intelligence. The current popularity of employee wellness programs demonstrates that corporate decision makers have a growing understanding of the connection between behavior, health and productivity. This course introduces students to organizational compensation, reward, and benefit programs and the theories of employee behavior used in their design and implementation. Topics include techniques to address external competitiveness (e.g., wage surveys, pay policies), internal consistency (e.g., work analysis and evaluation), recognition of employee contributions (e.g., individual and group merit programs), system administration (e.g., policies and communication), required and optional benefit programs (2–4 credits). Prerequisite: MGT 429 or MGT 5342. This course provides an introduction to the theory and practice of financial management in an international context. This course studies approaches to developing and maintaining coherent group functioning within organizations and to implementing planned organizational change. Prerequisite: MGT 429 or MGT 382 or MGT 5342. This course provides general managers with an understanding of key human resource factors needed to formulate integrated HRM systems that can support business strategies and provide a competitive advantage. Students learn about the processes that explain work behaviors, and how to promote behaviors to implement focused business strategy using staffing, development, and reward systems. Successful investing provides enormous rewards in terms of freedom and financial security. Socially responsible investing screens companies according to their industry and operational practices, looking for the businesses that will be sustainable in the long run. Prerequisite: MGT 350 or MGT 5500 or MGT 5502. This course trains an aspiring financial adviser or financial analyst in the methods of research and analysis used to invest in the sustainability sector and to create “green” financial products and services. This course explores the approaches to effective advertising necessary to achieve sales and market share objectives. Topics include review of consumer behavior and buying patterns, differences between individual and corporate buying, defining objectives, expenditure analysis, media selection; and the design, management, and evaluation of advertising programs. (2–4 credits). Enlightened managers easily move from broad awareness of strategic issues to the fine points of operational business decisions. Market research is the first activity that should be conducted when contemplating a new business or governmental activity. It is the means for refining an initial idea to a concept that is maximally supportable by the environment. Web analytics is a process that extracts useful business intelligence from data about customer behavior on the Internet. Marketing is the process of creating exchanges that satisfy individual and organizational objectives. Managers, who experience regular cycles of rest and activity in their mind and body, enliven organizing power. At the heart of sustainable business are customers who want sustainable products and value sustainable practices. Prerequisite: MGT 5780 or equivalent. This course examines the growing body of employment-practices law and its impact on human resource policy and decision-making. An understanding of the principles of human behavior at the individual, interpersonal, group, and organizational levels of analysis is critical to successful planning, organizing, and implementation by any manager. This course explores the dynamics of individual and group achievement from the perspectives of both skills and theory. World-class leadership in organizations involves both knowledge about and skills in leading individuals and teams. This course is a survey of negotiation, mediation, and arbitration methods of resolving disputes without litigation in the public as well as private sectors. Students gain practical negotiation skills through participation in negotiation and mediation workshops and the analysis of case studies. As Lean Management techniques sweep the world, accountants are asked to prepare reports and support decision-making utilizing a new set of reporting tools. In the past ten years, business leaders around the world have developed new methodologies to steer their organizations towards sustainable achievement of “Triple Bottom Line” success, i.e., financial results, social responsibility, and environmental stewardship. Through selected journal and website articles, students are introduced to the basic concepts of Lean Management as exemplified in the Toyota Production System. The elements, rules and tools of lean are explored as a methodology for aligning an organization’s strategic and operational plans to be consistent with Nature’s organizing principles. To effectively support lean management initiatives, accountants must embrace new procedures to prepare management reports that focus on inventory size reductions, tracking of waste and failure costs, and improved productivity and occupancy costs. They must reveal the causal factors that drive lean success. They must think creatively about how to structure compensation systems that encourage lean behaviors. Through detailed case studies and articles, students dig deeply into the details of how organizations have applied lean concepts to improve key management systems and accounting business processes. In this course for experienced international accountants, important topics are covered to orient accounting professionals to the USA workplace. Students learn the US-GAAP procedures for accounting for payrolls, uncollectible accounts receivable, marketable securities, periodic and perpetual inventories. Additional topics include preparation of financial statements, provisions of Sarbanes Oxley Act, convergence issues regarding IFRS, financial ratios for investments, and foundations of strategic planning. The aspiration of individuals to meet present needs without compromising the ability of future generations to meet their needs is most effectively undertaken on the community level. Prerequisite: consent in the form of written authorization of international student advisor. The goal of this course is for you to gain experience and understanding of consciousness as the unifying basis of all branches of knowledge. This course provides a foundation for all other courses you will take at Maharishi University of Management and introduces you to key ideas and terms relevant to your studies and to your experience here. Articulate how growth of consciousness and the study of inner subjectivity enrich education and other areas of life. In the Science of Creative Intelligence, students study the structure of the field of pure intelligence, from which all fields of knowledge arise. Only from this most fundamental level can knowledge be unified. This course examines how the creative intelligence displayed in every grain of creation arises in a systematic and sequential fashion from within that one basic universal field. 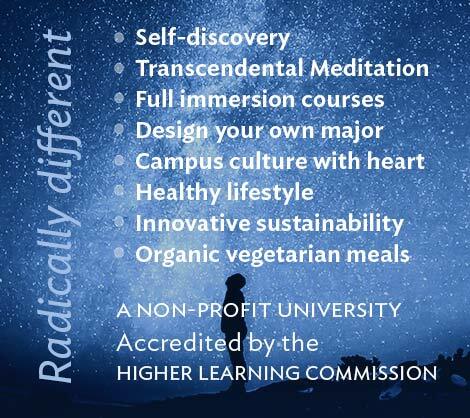 Students also examine how one can access and use that universal field of intelligence to bring fulfillment to their own lives and to life on earth. In 1972, Maharishi laid out the main principles of this new science in a 33-lesson, videotaped course. He integrated the understanding of nature’s intelligence provided by modern science (through its objective approach) and by ancient Vedic Science (which utilizes both objective and subjective approaches to gaining knowledge). Students not yet instructed in the Transcendental Meditation program learn this simple, effortless technique as part of the SCI course. (4 credits). See a more complete list and descriptions of Forest Academy Courses.